But is the procedure actually viable? Here's what you need to know. Cryonics is the practice of deep-freezing recently deceased bodies (or even just the brains of those who have recently died) in the hopes of one day reviving them. It has been the subject of serious scientific exploration and study — as well as a fair share of pseudoscience, lore, and myth. Fictional accounts like Batman’s Iceman, and the (untrue) rumors of Walt Disney being cryogenically frozen have, unfortunately, cast a speculative shadow over the field of cryonics. 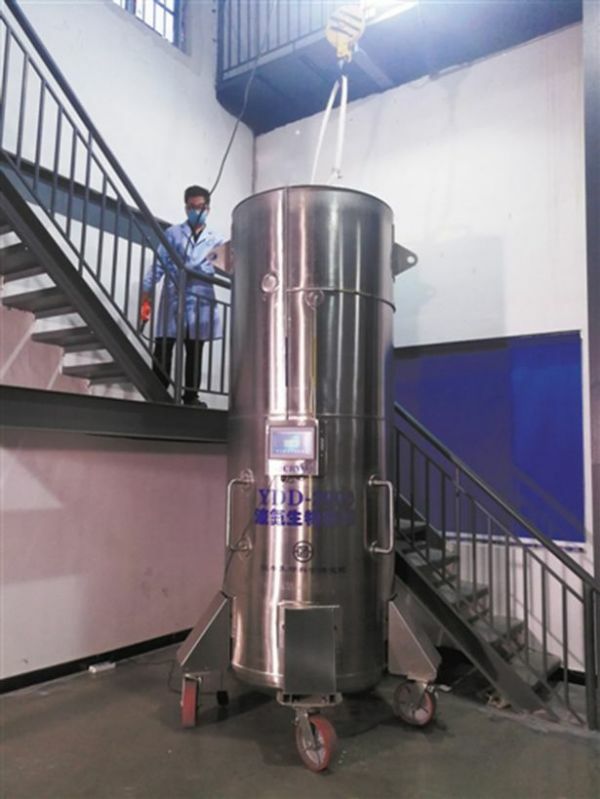 This procedure — which has Wenlian’s body resting facedown in 2,000 liters of liquid nitrogen — was completed at the Yinfeng Biological Group in Jinan. This project is the collaborative effort of the Yinfeng Biological Group, Qilu Hospital Shandong University and consultants from Alcor Life Extension Foundation, a nonprofit cryonics company based in the United States. Cryonics is all about timing. The bodies of the deceased are cryogenically frozen immediately after the heart stops beating. “Freezing” is a bit of a misleading term, because cryonic freezing is actually very specifically trying to avoid ice crystal formation — which damages the cells of the body’s tissues. Rapid cooling, rather than freezing, is a more accurate description of the process. A chemical cocktail of preservatives like glycerol and propandiol, in addition to antifreeze agents, are commonly used to get the body into a stable state where it won’t be decaying, but also won’t suffer damage from being stored at low temperatures for, conceivably, a very long time. From there, the bodies are given specific care that caters to the idea that death is a continuing process; one that can ultimately be reversed. The aim of cryonic preservation would be to one day be able to thaw the bodies and reanimate them at a cellular level — preferably without too many epigenetic changes. With our current understanding and technology, this process of reversing death so completely is just not possible. The closest kind of revival we have are the moments after clinical death where patients are revived by something such as cardiac defibrillation. Cryonics acts within this critical, albeit brief, period as well — but works within the belief that death is a grey area. More of a process rather than a definite, final, event. Just because we haven’t succeeded in reviving the dead yet doesn’t mean the field of cryonics is unnecessary or unimportant. This first case in China is a major step forward for everyone researching in the field of cryonics — and those of us who may, one day, hope to benefit from advancements in it. We may not be able to reverse death just yet, but it doesn’t seem out of the realm of possibility to imagine that, with such wild scientific advancements underway, technology could one day allow it to be possible. Whether or not it does in our lifetimes, this most recent development is certainly a positive one.